Global stock markets made one of the worst starts to a New Year in living memory with some dipping, albeit briefly, into bear market territory (defined as a drop of 20% or more from the last peak). The quarter was marked by considerable volatility with the initial sell-off followed by a strong recovery. The table above shows that returns for UK investors in overseas markets were enhanced by significant weakening of the pound. This was partly attributed to foreign investors repatriating their assets ahead of the forthcoming EU referendum. 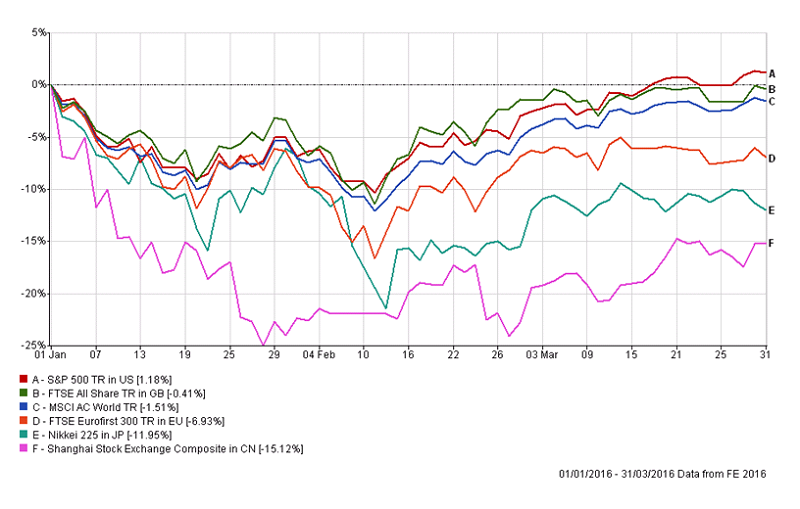 The US market was the best performer on the back of a relatively strong economy. The worst hit markets were China and Japan. The Shanghai Composite lost 15% in January as investors worried about more downgrades to GDP growth. At one stage trading was suspended following weak manufacturing numbers. Japan suffered from its close proximity and trading links with China and disappointing economic news flow although the strong Yen limited the impact for Sterling investors. Continued volatility in the oil price contributed to the FTSE 100, with its high exposure to energy and mining sectors, suffering particularly sharp gyrations over the quarter. It retreated 11% at its lowest point before subsequently staging a recovery of 12.5% by the end of March. European markets also failed to react positively to the move to negative interest rates by the ECB and economic data remained downbeat. The best performing sectors were those perceived as safe havens and diversifiers from Equities such as Gold and Government Bonds, despite their lack of income generation. As a result of this risk aversion, bond yields touched record lows. A number of factors worried investors with the primary one being OPEC’s* resistance to cutting oil production capacity in an oversupplied market. Between the start of the year and the 20th January the oil price collapsed to $27 a barrel. This followed the lifting of trade sanctions against Iran which raised fears of more supply flooding the market and triggered sharp falls in equities. Sentiment was not helped by a comment from the International Energy Agency that ‘the oil market could drown in oversupply’ and some bearish analysts cutting their price targets; the most extreme being Standard Chartered with a revised $10 a barrel. However, the price subsequently recovered strongly to breach $40 a barrel. Market declines are thought to have been compounded by ‘forced’ selling from Sovereign Wealth funds which invest the assets of oil rich nations. This affected mainly large, blue-chip global stocks and in particular the Banking sector where positions were built during the financial crisis. Other factors weighing on investor confidence included: concerns over continued weakness in Chinese manufacturing data; the extent of monetary tightening from the US Federal Reserve against a slowing domestic economy and lacklustre corporate earnings across the globe. The forthcoming EU referendum, announced for the 23th June, has been behind the sharp decline in the value of the Pound as overseas investors sold the currency. Analysts predict it could come under further pressure if the likelihood of a Brexit scenario increases. Moodys, the credit agency, has put the UK’s credit rating on hold and warned it may downgrade it in the event of a Brexit. The International Monetary Fund (IMF) has cut its global growth forecast in April by 0.2% to 3.2% for 2016, due to persistent low growth, followed by 3.5% for 2017. The OECD** revised its estimate more radically for 2016 from 3.3% to 3.0% and from 3.6% to 3.3% for 2017. An anticipated pick up in consumer spending has not materialised as consumers use windfalls from low energy prices to pay down debt rather than spend them. Furthermore, the collapse in capital spending by the oil and commodities sectors appears to have been faster and more extensive than expected. The IMF currently forecasts UK GDP growth of 1.9% for 2016 and 2.2% for 2017. The Monetary Policy Committee of the Bank of England (MPC) also cut 2016 forecasts for growth to 2.2%, from 2.5%, and CPI*** inflation to 1%, commenting that ‘recent volatility in financial markets has underlined the downside risks to global growth primarily emanating from a slowdown in Emerging Markets’. Once again the MPC kept interest rates on hold at 0.5%, where they have been since March 2009. The Markit UK manufacturing Index decreased in February to the lowest level for 3 years while manufacturing production growth hit a 7 month low. The Services sector also saw a setback with a slowdown in new orders which was blamed on the prospect of a ‘Brexit’ vote. More encouragingly the CPI inflation readings stayed positive at 0.3% in January and February, due to increases in the cost of petrol, food, alcohol and clothing, although the rate of wage growth has slackened. David Cameron renegotiated a new deal for Britain in the EU ahead of the referendum and the ‘Brexit’ debate is in full swing with the odds shortening on Britain leaving the EU. Both campaigns have signed up leading politicians and businessmen to present their arguments to the electorate. Key announcements for investors in the UK Budget in March were a reduction in capital gains tax, an increase in the ISA allowance and the introduction of a new Lifetime ISA to help the under 40s save for both a first home and retirement. These changes come into force in the 2017-18 tax year. However, the Chancellor decided against further radical reforms to pensions following the introduction of Pension Freedoms a year ago. The IMF forecasts US GDP growth of 2.4% for 2016 and 2.5% for 2017. The US has remained one of the more robust of the leading developed economies with manufacturing and construction spending remaining relatively strong. The latest jobs numbers and manufacturing data for March have beaten expectations. However, the Federal Reserve has made no further reductions in interest rates, stating that cuts this year are likely to be restricted to 2 rather than the 4 previously indicated as continued global market turbulence could suppress US growth. Nevertheless, most analysts do not expect a US recession while consumer spending, which accounts for two thirds of US GDP, remains buoyant. Once the candidates for the November Presidential election are known investors will probably pay closer attention to their policy intentions and how they may affect different industries and individual companies. Healthcare and Financial sectors could prove most sensitive to potential actions. The IMF forecasts GDP growth for the Eurozone to be 1.5% in 2016 and 1.6% in 2017. According to Eurostat industrial production increased by 2.1% on a month by month basis in January, the fastest growth since September 2009. Although the corporate earnings picture has been mixed the region is further behind other developed economies in the recovery cycle. Bond yields fell after the European Central Bank (ECB) cut interest rates below zero, with the 10-Year German Bund yield reaching an 8-month low, and signalled that further easing is possible in the coming months. It also increased its quantitative easing programme by 20bn euros a month. The downside of negative rates is the deflation risk so it was not surprising that the Eurozone slipped back into deflation with Eurostat revealing that consumer prices fell by 0.2% in February. The IMF currently forecasts growth for Japan of 0.5% this year followed by -0.1% in 2017. The economy contracted by 1.4% in 2015 and performance of the economy in the current year has continued to be lacklustre. Consequently, the ‘Abenomics’ programme of monetary, fiscal and structural reforms has come in for criticism for failing to deliver the desired effect. The Bank of Japan has recently moved to negative interest rates to encourage banks to lend to the weakening economy and Japan became the first G7 country to produce a yield of 0% on its benchmark 10 year Government Bond. In its economic outlook the Bank stated that ‘although the domestic economy continued to recover moderately uncertainties exist over developments in Emerging Markets and commodity exporting countries.’ The Bank also reduced its inflation forecast from 1.4% to 0.8%. Negative rates were intended to weaken the yen but actually the reverse occurred as fears of a slowdown in China and even another global banking crisis prompted a flight into perceived safe haven currencies. The strength of the Yen over the quarter put the shares of exporters under particular pressure, although many actually do a large part of their manufacturing outside Japan. The IMF predicts that overall growth in Emerging Markets will be 4.1% in 2016 followed by 4.6 % in 2017. However, this masks considerable divergence with growth this year estimated at 6.5% for China and 7.5% for India while Russia and Brazil are expected to see declines of -1.8% and -3.8% respectively. China has set its internal economic growth target for 2016 in the 6.5-7% range and appears to be switching from structural reform to stimulating growth. At the start of the year The Peoples Bank of China (PBOC) reduced the Yuan reference rate by 0.22%, and injected capital to support the market, which negatively impacted other Asian markets as their currencies strengthened. China’s Purchasing Managers Index (PMI) for January weakened for the 6th consecutive month and exports declined in January and February. However, in March exports staged a strong recovery, ahead 18.7% year on year in Yuan terms, sparking hopes of a revival in the economy. Some countries however, notably Russia and Brazil, continue to be adversely affected by low oil and commodity prices. The impact has been amplified by the strength of the dollar in which these commodities are priced and the fact that producers tend to hold debt in the US where interest rates have increased. Hence, it is particularly important to be selective and aware of which markets you are exposed to when investing in Emerging Markets. Markets have moved onto the front foot again following action by Central Banks, a firming of commodity prices and tentative signs that a US recession and a China hard landing are not materializing. However, greater evidence of improving trends will be crucial if the recovery in markets is to continue. Following recent revisions, expectations are for moderate growth in the global economy. Consumer spending is expected to be the engine of this growth with inflation rising slowly as wage growth continues amidst low unemployment levels and the oil and gas effects drop out of annual figures. Industrial production will need to hold up if further downgrades to global GDP are to be avoided. So it seems increasingly likely that in the months ahead we may see more interest rate loosening from the Central Banks in Europe and Asia. Just three months on from the December interest rate rise in the US and following Japan’s adoption of negative interest rates there is now wider consideration of such policies, among developed world economies. However, if the Federal Reserve does persist in raising rates, the dollar could strengthen, leading to renewed pain for Emerging Market currencies and economies. There are hopes that the next OPEC meeting on the 17th April could lead to a freeze in oil production and help support the price of oil. Saudi Arabia, the biggest oil producer, has described the collapse as ‘irrational’ and expects a price recovery even with maintained high production levels. Many Emerging and Asia Pacific markets do not look expensively rated but may continue to be volatile if their currencies come under pressure and economic data from China deteriorates. Longer term, a Chinese economy rebalancing from over-reliance on heavy industry to a consumer focus should be positive for the global economy. Japans’ Nikkei index fell sharply over the quarter yet further monetary stimulus and improved shareholder returns as a result of structural reforms could renew interest in this stock market. The Bank of England has warned that the short term outlook for UK economic growth is at risk from the uncertainty surrounding the EU referendum. The Bank highlighted that financial institutions are preparing for the pound to come under pressure if voters choose to leave the EU. There is already evidence of a slowdown in Foreign Direct Investment (FDI) in the UK economy and in the event of a Brexit economists are forecasting a negative impact on economic growth, the extent of which will depend on how quickly alternative trade arrangements can be negotiated. The reverberations of a Brexit could have detrimental implications for the UK’s trading partners within the EU. In summary, there are undoubtedly a number of hurdles to negotiate over the remainder of the year. However, difficult and volatile markets can throw up good opportunities for active fund managers to sort the wheat from the chaff and find companies that can prosper in the prevailing conditions. It is also worth remembering the importance of remaining invested as missing out on the best days in the stock market (which often follow the worst) can have a very detrimental effect on long term returns. After the sharp recovery from the oversold position in January on little positive news, and some important events on the near horizon, a period of consolidation looks possible before an upward trend resumes.